There is a real interest nowadays in meditation for psychic development for increasing psychic and paranormal abilities, and entering the world of the esoteric and the occult. Many of us dream now and then of getting some fancy psychic abilities, being able to show them off to friends and being able to do something that most other people can't. If you're one of these people (I certainly am! ), then the good news is that meditation for psychic development helps greatly with this goal. Of course meditation has many other benefits as well, starting from health, spiritual benefits, and advantages for simply relaxing a busy mind at the end of an extremely hectic day. But if you've ever dreamed to be able to be better at reading tarot, or throwing PSI balls, or finally mastering astral projection, or even read someone else's mind, your main foundation will start with meditation. 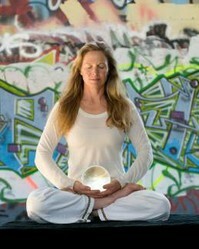 Here are just some of the ways meditation for psychic development helps enhance your intution and your psychic skills. Have You Ever Dreamed Of Having Enhanced Psychic And Paranormal Skills? Yes all the time. 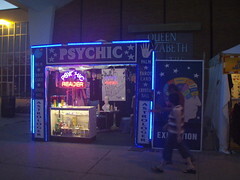 I wish I had some psychic skills to impress my friends with! I am a psychic and I know that meditation helped me greatly be where I am right now! I don't believe in psychic skills! Has it ever happened to you to think of a person that you haven't kept in touch with for a while, only to get soon after an email from them, or maybe a phone call? Or maybe you had a funny feeling in your gut about a new job and you fail at your job interview - only to discover later that indeed turnover is very high because the boss is a real jerk? Or you've been talking to a friend only to realize that you're both finishing each other's sentences? These are all latent psychic skills. Some people call it intuition, but I personally believe that intuition is a first step to enhanced psychic abilities. So how can meditation for psychic development help with increasing your skills at ESP (extra sensory perceptions)? When you meditate, you remove all the chit-chatter from your mind. You basically let your mind go blank and you become very focused, very aware of the here and now. Meditation heightens the intuitive awarenes that is already in us. You will soon notice more of those strange coincidences happening in your life, as long as you practice meditation regularly. Our mind is in a constant discussion with itself during the day, and sadly while this helps in a way, it also hinders focusing on what matters most - our subconscious mind. Through all this chatter, the subconsicous part of our mind simply can't get heard - at all. For the psychic skills to develop, you will need full access to your quiet mind, so that you learn to hear your guides' voice. You need to have full focus and control over your mind, and psychic meditation will help you there, since all you are doing when meditating is learning how to empty your mind - and keep it empty for a longer period of time. Meditation is the perfect way to learn astral projection. But what is astral projection in the first place? Imagine sitting on your chair or couch, or lying on your bed, in a relaxed position. At some point you become so relaxed that you can induce astral projection, whereby you feel yourself floating above your body in the room. You can actually see your own body on the chair or in the bed, lying there motionless and you are at the same time out there, exploring the world from above. It can be at first scary if you don't know what to expect, but this is an amazing thing to experience. Just like in dreams you can fly anywhere, you can think yourself somewhere and be there. You can go and 'spy' on your friends if you're so inclined, and then the next day tell them precisely how they were dressed or what they were doing at the time the day before. Your astral body separates temporarily from your physical body and it can enjoy all those things that we can't do in our normal waking life. With meditation, you get in that extremely relaxed state much faster. Meditation is the main vehicle to get you there in no time. There are many astral projection techniques for beginners to try. One easy way to do this is by astral projection meditation. The main difference between this meditation technique and others that you are using to simply quiet your mind is that here, once your mind is really relaxed and alert, you visualize your astral body, your astral self. You imagine your body floating above your physical and feel that you are really there. This will allow you to go into a really deep trance that will make it quite easy to astral project. Just like with astral projection meditation, meditation for lucid dreaming helps you achieve lucidity in dreams quite fast. Lucid dreams are those where we are dreaming during our sleep, and we become aware in the dream that we are in fact dreaming. Some people use this technique to get out of nightmares. Once you are lucid in your dream, you can do anything you want there, including confronting the monster that was chasing you, or simply telling yourself that it is a dream and it's time to wake up - upon which you really wake up. Many people are learning how to induce lucid dreams because this is one way to not only have extreme fun in dreams (flying to the moon anyone? ), but also to learn more about their inner, spiritual self. By meditating you improve your imagination, your visualization skills and you will find it much easier to enter the world of lucid dreams, which in turn can heighten your psychic skills by leaps and bounds. Meditation induced lucid dreams should be mostly practiced in the evening before going to sleep. In the bed, instead of falling asleep, start your meditation with the intention of becoming lucid in the dream. In many cases, as you fall asleep from the meditation, you enter a dream and you will become lucid, recalling that you are, indeed, in a dream. So if you want to learn how become a lucid dreamer, give meditation a try, you'll be pleasantly surprised! If you're learning to read tarot cards, you might find that you will become much better at it if you are using meditation on the tarot. Before reading your cards you meditate on them, you clear your mind and let your guides talk to you. You will notice - and your clients will tell you too - that you will be much more accurate (unless you're a highly skilled psychic in the first place). You will reveal truths to your clients that not only are extremely accurate, but also highly relevant to their situation in life right now. If you are already skilled at meditation and you can achieve the alpha state of mind easily, then you can meditate on the tarot cards right as you lay them and read them for the client. You can meditate on the major Arcana, or while reading the Celtic Cross tarot. The possibilities are endless. What Is Your Experience On Meditation For Psychic Development? Wow, I was just thinking about this topic last night as I was watching The Long Island Medium television show. If Caputo is to be believed our families are still all around us. Last night an older woman was having dinner with her son. Caputo went over and told them that the husband and father was sitting right beside them in the chair. All I could think of was who's sitting in my living room right now! I spent a few minutes thinking about how I could find out. Thought-provoking look at Theresa Caputo, a Psychic Medium, who lives on Long Island and is now the star of her own reality television show.